Well. What a great day we had at the Durham at War Conference last Saturday (26 November). Thank you to everyone involved, nothing went wrong, there were lots of interesting talks and lots (and lots) of food, from the lovely buffet to the First World War Bake Off entries. Most of the Durham at War volunteers work remotely so don’t get to see each other, or see how the project is going as a whole. Indeed, there were some people we were only meeting for the first time. 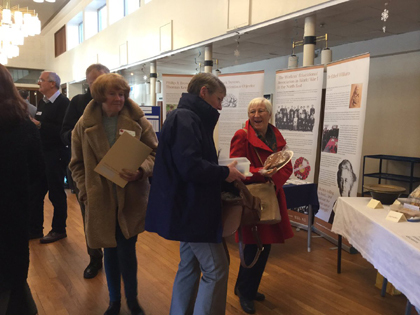 We had a variety of stalls from projects we had partnered with to local history groups, the Record Office itself, and the Friends of Durham Record Office running one of their always fantastic tombolas. The Chairman of the Council, Eddie Bell, opened the proceedings before we had a video from Zelda at the Heritage Lottery Fund. John Sheen was the first speaker of the day, telling us how his interest in the First World War began, running through to where he is today. regular readers will know that John has written several blog posts for us, as well as books, and he is now writing essays for a Masters degree. He is also sharing some of his vast collection of militaria with the Durham at War website. Then it was time for the First World War Bake Off, with several trench cakes, some parkin, and a variety of Anzac biscuits. Attendees voted and the winners were announced just before lunch. 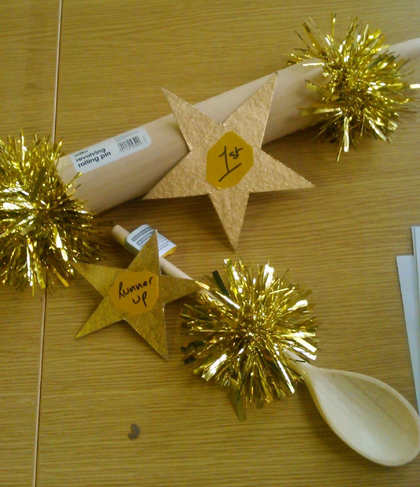 First prize of the golden wooden rolling pin went to Margaret Hedley of Wheatley Hill History Group. There was a tie for second place between John Sheen and Kevin Richardson of the Fallen Men of South West Durham. John conceded his position, and Kevin accepted the golden wooden spoon on behalf of his wife who actually did the baking. 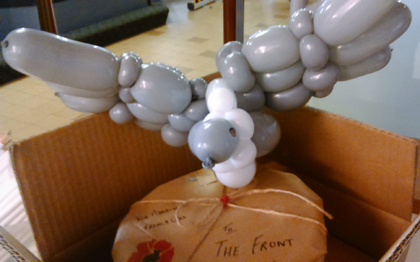 We also discovered that another of our volunteers, Margaret, does balloon modelling, when she delivered her Bake Off entry by pigeon post! Our keynote speech was given by Anthea Lang and Dr Malcolm Grady about their ongoing research into German pork butchers in the North East, and the different triggers for the anti-German sentiment they faced. This talk was complemented by Carol Hunt and Andrea McIver-Hunt talking about their great-grandfather, Theodor Fiedler, who was a German pork butcher in Shadforth. Readers may remember their account of their visit to The German Pork Butchers’ Descendants’ Reunion. The pigs, Sir Scoff-a-lot and Sir Scratch-a-lot, were in attendance at the conference. Next up was the winner of ‘furthest distance travelled’, Jim Busby, who flew in all the way from Winnipeg in Canada. Jim talked about his own First World War research, and how he, without any prior Durham connection got involved in the project. He is connected to the county now with the help he is giving us, and volunteer Jean, in researching the men of County Durham who emigrated to Canada. After lunch, Dr Sarah Price, from Durham University, gave us a run down on the collaboration between the University Library at Palace Green and the DLI Collection at Sevenhills to help continue access to these unique objects. The last of the official speakers was Peter Welsh from the Wessington U3A War Memorials Project who wowed us with a rendition of the Lambton Worm by way of introduction. He went on to speak about the films, and other work, the group have done, and showed an excerpt from their latest, ‘Wear at War’. Copies of this are available to buy here in Durham County Record Office for £3, or two for £5, and comes with a choice of cover. The day was rounded off with people able to informally say a few words about their contribution to the project. We are really pleased with how the day went and have had some lovely feedback. The only thing is, everyone enjoyed it so much they want another one next year, and I think we have set a high bar for ourselves! On a final note, Jo thought it would be a good idea to ask each other questions about the day. See below for our Q&A. What was the highlight of the day? Conversely, was there a low point? What should we do differently next time? Check that the sound is working earlier than 10 minutes before we were due to start. How many sausage rolls did you eat? If the conference was a Marvel character, which one would it be? Captain America. He stands for honour, he stands up for the ‘little guy’; we’re trying to highlight the stories of the everyday people and honour them. That’s probably more the project than the conference specifically. Did you learn anything new at the conference? I learnt that even if you have two technical run-throughs everything can go pear-shaped 10 minutes before everything is due to start when the sound doesn’t work on the audio-visual system. What have you taken away from the day (aside from leftover food)? Well, the food is a given! Never knowingly under-catered! For me, the day was a great chance to meet old friends, new faces and some new faces that instantly became old friends. I was also just amazingly impressed by the range of work that the volunteers do for us and how we have, somehow, managed to assemble this fantastic array of individuals, groups and supporters from within the county, throughout the country and across the world. How many pieces of trench cake did you eat? Not sure. I lost count! My favourite was the parkin; that’s what got my vote. And, to be honest, after all that talk of Pork Butchers, I was hanging for a sausage roll. If the conference was a cake, which one would it be? Mmmm, cake. I might have to say trench cake. It wasn’t particularly fancy, it had some unusual things in it but all the ingredients worked together to create something that was genuine and that hopefully people will appreciate for some time to come. 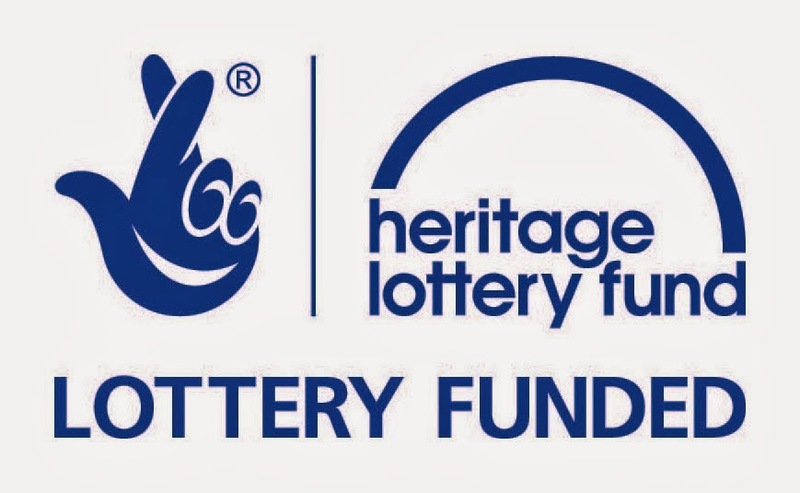 This is a Durham County Council project supported by the Heritage Lottery Fund Heritage Grants programme. The archive, museum and archaeology services at Durham County Council have developed this project to make the heritage collections of the historic County Durham in 1914-1918 more accessible during the centenary commemoration period. It will help people to learn about, research, enjoy, preserve and share the First World War heritage of County Durham. Lance-Corporal John Harkess pressed two poppies, carefully wrote the names of some of the places where he served and sent them back to his County Durham home during the First World War. The poppy in the logo takes its shape from one of these. Durham at War will cover the combined area of present day and historic County Durham, and the centre of the poppy takes this shape. First World War in County Durham. Simple theme. Powered by Blogger.